Shelby Young is the voice of Leia Organa in Forces of Destiny. 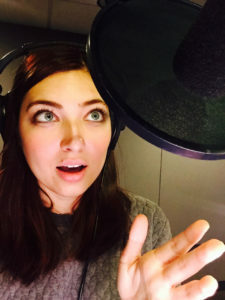 Shelby has worked as an on-camera and voice-over actress for years in film and TV and has also done voice-over and motion capture work for video games. She was kind enough to answer some questions via email for 365 Days of Star Wars Women. My earliest memories are of my stepbrother, Chris, obsessing over the Star Wars films and The Clone Wars. I would catch bits and pieces but I never really sat down and watched anything SW related until I was shooting a video game in 2011. One of the crew members started teasing me when he found out I had never watched any of the films, refusing to call me by my name and only calling me, “Princess” or “Your Worshipfulness”. So I made a deal with him that if I watched just one Star Wars movie he’d let me be Shelby again. Of course, after A New Hope ended I was hooked and then binged the rest. I think that somehow these geniuses were able to make a movie about people in space waving around sticks of light featuring aliens, smugglers and the works RELATABLE. It’s really a testament to a great writer, director, and actors when watching a sci-fi or fantasy film and feeling, as an audience member, you could really experience that. There are countless sci-fi/fantasy movies I’ve seen where it feels like a fully unattainable world, but Star Wars is so easy to connect to. I think that’s one of the reasons it’s really survived the test of time and has totally made a resurgence into popular culture over these last few years. That, and the stories are just badass. What were your early acting roles and years like? I’m always curious what kind of acting (commercials, theater) people were up to that don’t show up as IMDB credits. When I was itty-bitty my mom put me in a pageant for fun one day, just something to do in our hometown in Florida. But then I ended up winning, which no one expected, so I had to go to the next pageant and it kind of kept happening for a while but the pageant world wasn’t for us so we called it quits. However, some of the judges were commercial and modeling agents who wanted to sign me, so after a year or so when I was a little older my mom finally gave in to my incessant begging and let me start pursuing acting for real. I was a little blonde thing so I worked a lot as far as modeling for Vogue Bambini and other magazines and then I think I did my first commercial when I was around 4 or 5? All I know is I just found the first SAG commercial I did on Youtube for a board game called Puppy Racers (gotta love the internet). I did probably around fifty or so commercials in Florida, I was also in a few plays back then, including one in elementary school where I played a jam peddler in a production that was a mash-up of different fairy tales (I was very upset that I wasn’t playing a princess). After I moved to New York I was a hand model for a bit and then a fit model for a few different clothing companies, I was a QVC model for a day, worked parties as off-brand princesses (ala ‘Sleeping Girl’ and ‘Red Headed Mermaid’) and have had a few other odd-jobs in the entertainment industry which all lead me to film and TV. 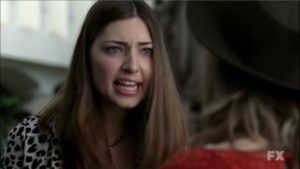 Shelby Young as Leah in American Horror Story. You played Leah in American Horror Story’s first season. Did you or do you think the cast and crew knew they had a huge hit on their hands before the show aired? Any fun stories from that experience? That was honestly one of my favorite experiences in my career, thus far. Also I’m just a mega-fan of anything Ryan Murphy touches. I definitely think everyone knew they had something special on their hands, but I don’t think you can ever predict just how big of a hit something’s going to be. Working with Taissa and Evan Peters were highlights for me, it also led to a great friendship with Taissa which I’m thankful for, she’s a really cool girl who I rarely get to see anymore because she’s absolutely KILLING IT, but it’s nice when we do get to catch up! For the pilot episode we actually got to film in the “Murder House”, I know they rebuilt it on a sound stage for the rest of the series, but it was definitely spooky. Wasn’t hard pretending to be freaked out in that basement because I really was. When I was living in New York as a kid, I booked an animated Lucky Charms commercial. I really lucked out because Saatchi & Saatchi, the ad company for General Mills, liked to re-hire the same talent, so I worked pretty steadily for them, voicing more Lucky Charms, Trix, Coco Puffs, etc. commercials. Then when I moved to California, I stupidly took a long break from voice acting, which I still kick myself about to this day. I would do an odd radio spot here and there and I recorded a Cartoon Network pilot which unfortunately didn’t get picked up, but I wasn’t actively pursuing the craft until I ended up booking Dead Rising 3 through my theatrical rep’s. While on set in my mo-cap suit I had this epiphany of, “Wait a second… I really love this… and I can pursue on camera acting AND VO!”. My love for VO just kept growing from there and now just TRY and stop me from getting behind a mic, I dare ya. Do you feel like there is a particular type of voice you specialize in? I think as a voice actor you have to be really versatile. As far as characters I’ve played the most, I’m often cast as a tougher chick with a deeper register. But, I’ve also voiced a handful of young boys and girls, which is always fun. I also have a scarily realistic baby cry that I love to pull out in public when my boyfriend’s bothering me. A fun and interesting niche I’ve found myself in recently is voice-matching celebrities when they’re unavailable to record pick-up lines for their films. This was something I never really realized I could do until my first audition for it, truthfully it wasn’t even something I knew existed as a job. But I’ve voice-matched for several big actresses now. It’s really fun to kind of become them for the hour or two that you’re in the booth. 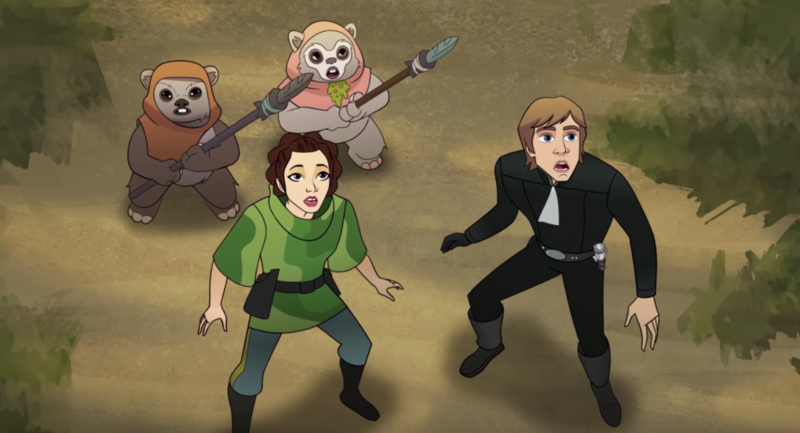 Did you know you were auditioning for Leia (or even a Star Wars project) when you auditioned for Princess Leia in Forces of Destiny? Yes, I did. They used a code-name for both the character and the project but I knew they were looking for a similar sound to young Carrie Fisher so that kind of gave it away for me. I didn’t know what kind of project it was, video game or animated series. But I was grateful to have any info, because before (and during) recording my audition I had clips of Leia on repeat, really trying to hear her tone, how certain words were emphasized and trying to match her strength and amazing sass. Did you listen to other actors that had voiced Princess Leia (Catherine Taber, Julie Dolan, etc) before you worked on Forces of Destiny? I waited to listen to any other versions of Leia until after I felt comfortable in the role because I didn’t want their performances to influence mine. Every one of those talented women has brought something special to Leia, their own spark, so I wanted to bring mine as well, while still staying true to this wonderful character that Carrie Fisher brought to life. 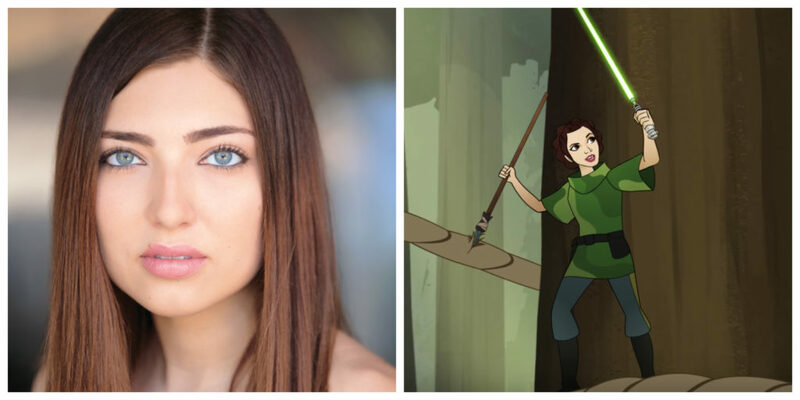 Shelby Young voiced both Leia and Kneesa in the Forces of Destiny episode “Traps and Tribulations”. Do you have a favorite Forces of Destiny episode? It’s hard because I love them all so much! Hmm, as far as Leia episodes, “Traps and Tribulations” is probably my top favorite. Hearing myself as Leia next to Mark Hamill’s Luke was just mind-blowing. What a powerhouse he is, I have so much admiration for him. I also loved that I was able to voice Kneesaa in that episode as well. And having Luke and Leia working together AND Leia wielding a lightsaber for, I believe, the first time in canon was just… wow! Another favorite of mine is “The Starfighter Stunt” starring Padmé and Ahsoka. I love Cat’s Padmé so much and then Ashley Eckstein as Ahsoka is always incredible. Are you alone in the studio when you’re working on Forces of Destiny or are you able to be in the same room with other actors? How long was it from the time you received the script to the time you recorded the dialogue? Each session is different. I was able to record with Tiya Sircar for our episode together, AJ Locascio as Young Han for “An Imperial Feast” and then the creature-king Dee Bradley Baker as Wicket while I was recording Kneesaa. For all of the rest, I was in the booth by myself. Also, I usually receive scripts a few days in advance. How is the process different in a video game as an actor? Do you enjoy working in one medium more than the other? It depends on the video game. From motion capture, VERY different. But from a regular record session, not too different at all in my experience. I’ve been so lucky to work with very hands-on directors who really have visions as to what they want from a character. At the end of the day, it’s all acting, it’s all putting yourself in the headspace of a character, the medium doesn’t change that too much for me. Annie in Dead Rising 3. What video game role has been your favorite or most challenging so far? 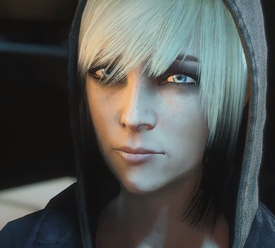 Annie in Dead Rising 3 really pops out for me. She was so much fun to play, plus the team I was working with was incredible. DR3 was my first motion capture experience and there was definitely a learning curve at the beginning but it’s crazy how quickly those suits feel like your own skin. You even forget about the bright camera light in your face as soon as action is called because you’re just there, in the moment. But I owe a lot of what made that experience so special to our director, Tom Keegan. I’ve been incredibly lucky to work with him on a few projects since then and I love that man so much, he’s the tops when it comes to directors in this industry, across all mediums. He really helped me bring Annie to life. I definitely cried when we wrapped, I didn’t want that shoot to ever end. All of them?!! If Lucasfilm comes a calling I will gladly play ANYONE. I love getting to lend my voice to such an established, iconic character and it would be really fun to play an original character as well! That’s the great thing about this ever expanding galaxy far, far away– new characters are always being introduced. Also, if I could somehow be involved in the films one day, whether as a voice or on-camera role, I would probably faint. A girl can dream! All of my interactions have been through social media but I love chatting with Star Wars fans! I like to do Q&A’s when I’m bored on airplanes, so that’s always fun to answer questions. But I try to be accessible to fans and friends alike on social media — plus I’m an internet-aholic. First step is admitting you have a problem, right? I’m gonna head to Comic-Con in a couple of weeks so maybe I’ll end up meeting some Star Wars fans in person! Unfortunately — I CAN’T! And it’s killing me! I have a few really cool on-camera and VO projects in the works but mum’s the word for now. Those NDA’s are scary! You can find Shelby Young on Twitter here, on in Instagram here, and click here for her website.